If you have been following the news, you’d probably know that British Prime Minister Theresa May, is currently in India for a bilateral trip. She started her tour with a visit to the Halasuru Someshwara Temple in Bengaluru on November 8, but even before the news of her first official event hit the stands, she got the Internet abuzz, thanks to her outfit. May wore a traditional beige and green jute silk saree along with a green blouse and looked absolutely graceful and comfortable in the ensemble. Sticking to the tradition, she went inside the sanctum sanctorum and offered prayers to Lord Shiva and took the aarti while the priests chanted mantras. She was also explained and informed about the history of the temple as well as the significance of offering prayers there. Not to forget, she even wore a gold kada and bindi along with her saree, as most married women do when they go to the temple. During her visit, she and was reportedly also presented with 'bagina,' which is a gift comprising of essentials such as saree, blouse, bangles, vermilion, tumeric, mirror, comb, rice, gram, jaggery, fruits, sweets, coconut and shagun. According to tradition down south, all these essentials are placed in a bamboo plate and gifted to women, in order to get blessings from Lord Shiva. And while this wasn't something most Indians expected, they were certainly elated to see her don that gorgeous outfit. Many lauded her for her grace and had some very sweet things to say. 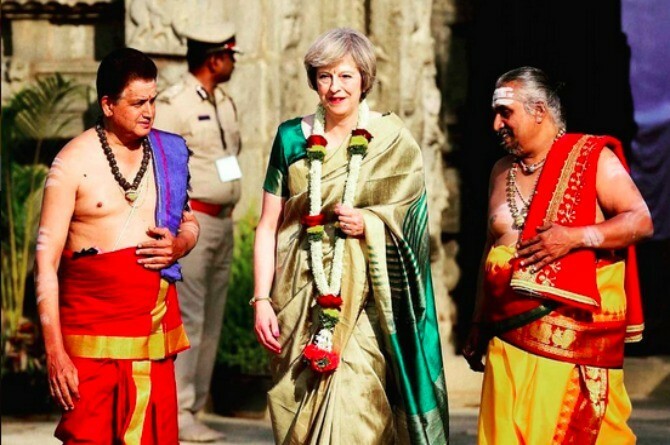 Continue reading to see what Indians thought about her saree and some never-seen-before images of Theresa May in another saree. Since many Indians loved her avatar at the Someshwara Temple, they used witty one-liners to laud her grace and even congratulated her on getting it right the second time. In fact, one Yadu Singh even shared a picture of May dressed in a turquoise saree, she wore for an event a few years back in 2010. It certainly looked like the British Prime Minister was happy to drape the garment and so was the Internet! "How do you comfort someone who has had a miscarriage?"